The Advance putty is designed for use with all therapy hand exercises. 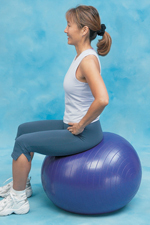 The Base Putty is ideal for light resistive exercises in a beginning exercise program. As strength increases, add a partial or whole Power Pack to the pink Base Putty and create a more resistive putty. stretch and fold the putty to increase the resistance even more. The more you stretch it, the more it resists! Non-oily and fragrance-free. The Regular Kit is recommended for small to medium-sized hands. It includes one pink Base Putty and four individually packaged blue Power Packs. The Large Kit, recommeded for large hands, includes one pink base putty and six blue Power Packs.